I may not know you personally, but I know your parents. On a certain level, one could say that you represent the second generation of the Gush Emunim settlement movement, among whose founders were your parents and me. Recent events – the firebombing in Duma; the soldier who shot a disarmed attacker in Hebron; your comments this week – and the polemic they engendered have reawakened the need to bring into focus the profound meaning of our presence in this land. The settlement movement that issued forth from the teachings of Rabbi Abraham Isaac Kook bore with it a spiritual vision of the return to the land. In his book “Orot,” Rabbi Kook repeatedly describes the Jewish people’s mission to bear the torch of the light of God, of justice, morality, love and kindness, in the world. Notably, he portrays this mission in universal terms. 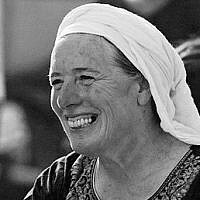 That is the purpose of our return to the land, that is the true Jewish courage, and that is what we must actualize here. Let me tell you, Bezalel, that his son, Rabbi Zvi Yehuda Kook, said on multiple occasions, “We have nothing against Ahmad or Mustafa. We do not fight the Arab man because he is Arab.” Or, as the elder Rabbi Kook put it, Jewish nationalism must remain untainted by the impurity of racism, for otherwise it has no right to exist. Rabbi Kook, like other early Zionist thinkers, saw the Zionist idea as a spiritual message that would imbue the world with the light of justice and morality, with love of man and his holiness, and that would realize its message in the land we’ve always yearned for. That is our message, and it is with that grand spirit that we established a state. That is the historic, divine process that reconnected us to this land, and that is our mission in the world. Within this process, we must bear in mind that the Palestinian people that dwells in this land is not a mistake of the divine plan. It is here so that we can learn to establish ourselves in the land while broadening our perspective on reality. This is a word of God that we must internalize: how to live here by building dialogue with another people, another culture, another religion. Indeed, it is a difficult task, one that we must carry out by way of the structures with which we conduct our lives: the institutions of government, culture and welfare; civil society and the military; and the education system. The issue goes way beyond the question of where to build a settlement and how to protect it; it is at the core of our very existence, and if we will fail to internalize that fact, we will not remain here. The Jewish people, consciously or not, is the bearer of a profound spiritual message for the world, and it will not allow you to lead it if you are guided by a racist outlook that denies the other’s existence. If you see the other in a negative light, if you can’t relate to his celebrations, or if you consider his child a potential murderer, then you do not comprehend, and you are unfit to lead, because you are narrow-minded and controlled by your existential fear. Your outlook pulls the ground out from under our very existence in this land. That is not the purpose of our arrival here – to dominate, to expel the other, or to deny his right to exist. The idea that one can embody holiness, purity and a deep connection to the land through the denial of another’s existence is not only unrealistic; it is evident of a profound spiritual miscomprehension. Sadly, your words lead our entire national religious community to the brink of a chasm that undermines and threatens our very existence. Both you and your wife, who was quoted in the media, and we, as a community that seeks to blaze the path of our return to the land, must search our souls and realize that we will lose our way if we give in to fear, segregation and hatred. You, Bezalel, have lost your way. Take back what you said before it is too late and everything will crumble into the abyss. I call upon you, and upon the community of which you are a leader, to internalize a turn of phrase coined by my late husband, Rabbi Menahem Froman: “The settlements are fingers extended in peace.” Only through a deep connection to the land, and to the word of God, can we truly succeed in bringing the Palestinian people closer to the love, peace and holiness inherent in it.